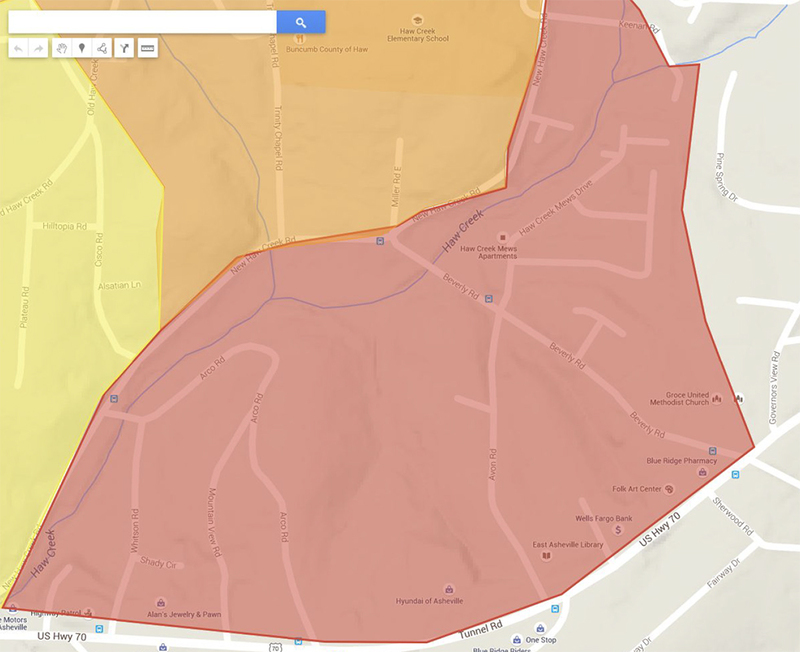 Haw Creek is a very large neighborhood compared to other Buncombe County communities. However, if we look at Haw Creek as smaller sections, we can map out our vision piece by piece. We divided the community into six sections. 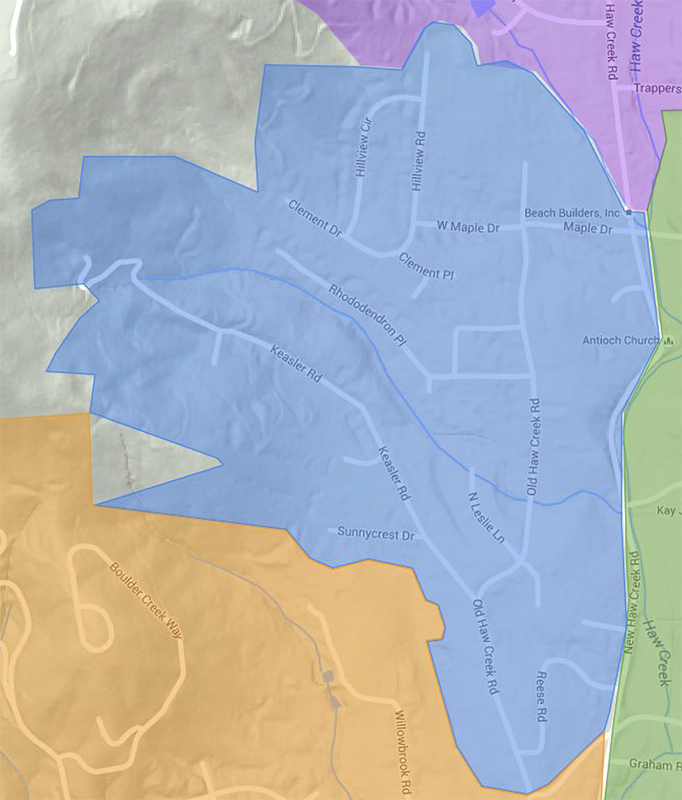 Each one of these sections is as big or bigger than other Asheville neighborhoods. Each section has different priorities and concerns such as sidewalks, development, neighbors, bears, zoning, roads, buses, etc. The Haw Creek community is diverse. It includes subdivisions, apartments, planned unit developments, as well as single family homes, subsidized housing, businesses, churches, and schools. The old, the new, and the renewed all across the valley. In each house and street people form networks of communities within our great neighborhood, and we want to foster those communities and help them thrive and grow. The purpose of these maps is to help make our neighborhood more cohesive by sharing HCCA information via a neighborhood network with a zone captain being in charge of each zone. What would be the duties of a zone captain? As zone captain you can get to know your neighbors by organizing cookouts, progressive dinners, book clubs, start a neighborhood watch within your zone, hosting block parties, etc. You can share pictures on our Facebook page to let others know what you’re doing. You would ask other neighbors to deliver HCCA information in your zone. The goal is to have the majority, if not all, of Haw Creek involved in keeping Haw Creek a great place to live. If you are interested in being a ZONE CAPTAIN please contact HCCA at info@ilovehawcreek.com. Major changes in the landscape will continue to occur. Haw Creek is a very special place to a growing population. As of 2015, we have a thriving neighborhood, with restaurants, two schools, and many more families, businesses and churches. The following maps describe each section with it’s unique characteristics and landmarks. This is a starting point for the community to build on and adapt and plan for Haw Creek’s future. 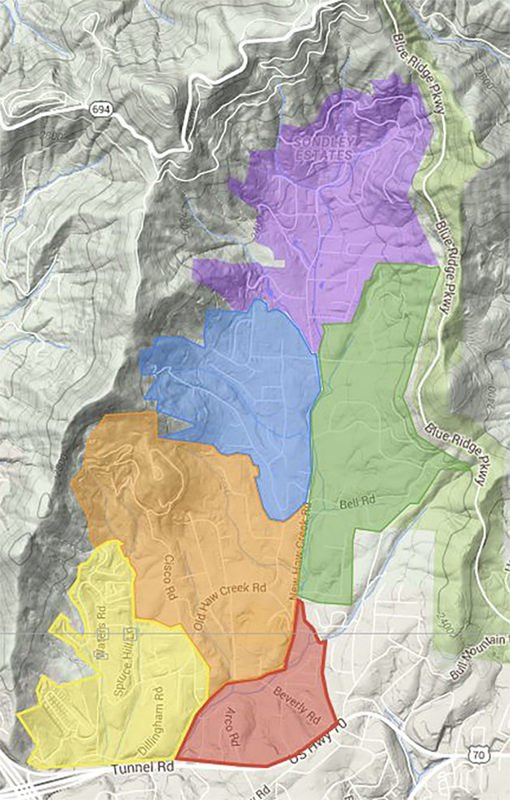 Please, review these maps and descriptions, then send us your comments and suggestions to info@ilovehawcreek.com. We would love to hear from you. 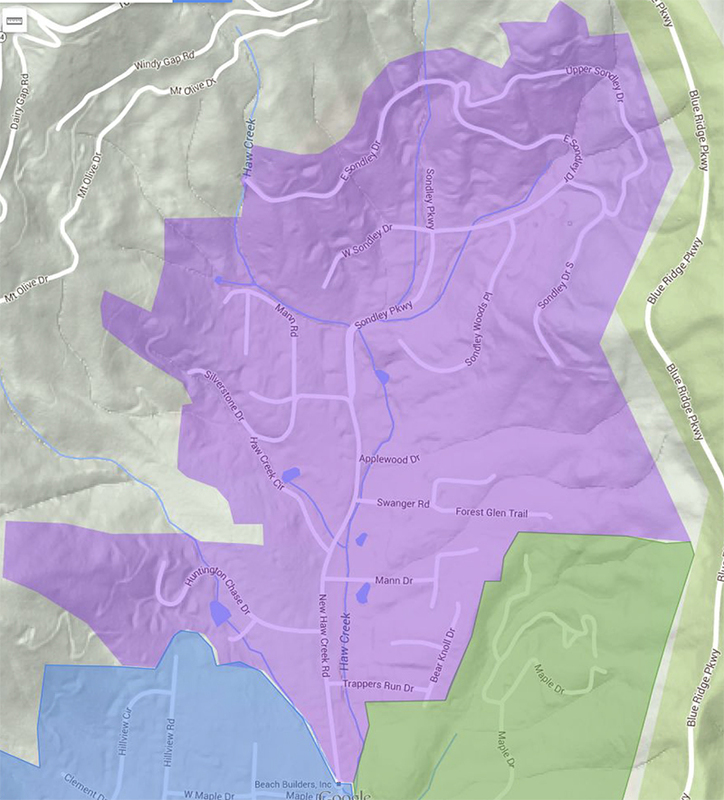 North Haw Creek(PURPLE) includes many communities off of New Haw Creek road: Sondley Estates, Haw Creek Circle, Munn Dr, Mann Rd. Silverstone Dr, Swanger Rd, Huntington Chase and Trapper’s Run. The Historic Sondley home is found here and also the headwaters for our namesake creek. Northwest Haw Creek(BLUE) includes areas off of Old Haw Creek which are on W. Maple Dr., Rhododendron Circle, Kessler Rd., Leslie Ln., Sunnycrest Dr., and Reese Rd. This section is bordered by New Haw Creek Road to the east, the Fire Dept, and a tributary to the north. 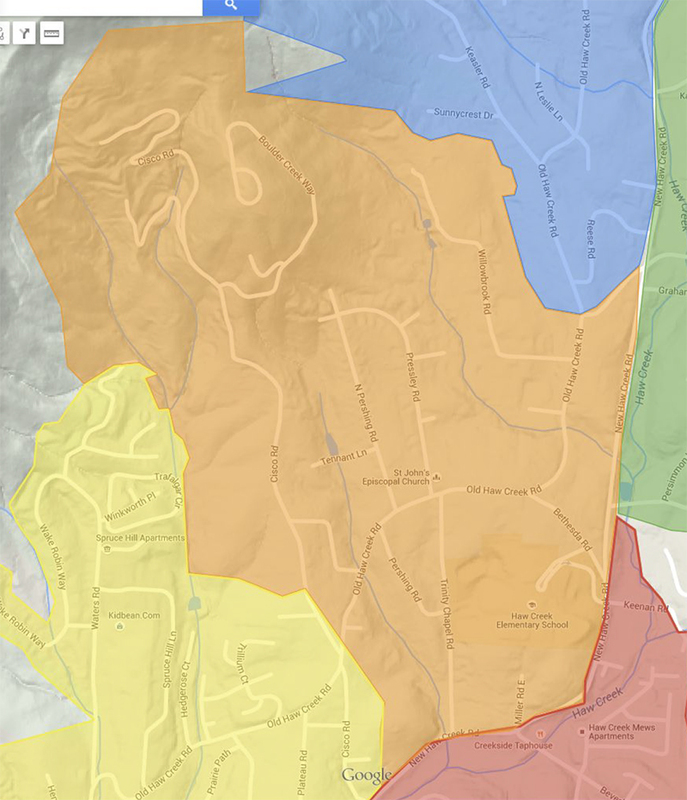 West Haw Creek(ORANGE) is the middle of Haw Creek, including Haw Creek Elementary, Willowbrook neighborhood, Cisco road, Pershing, Pressley, Bethesda, and Trinity Chapel road. St. John’s Episcopal Church is at the center of this area, and has been one great community center. Bethesda Methodist Church and historic cemetery is also central to the area, which will soon serve as a community center and Methodist mission and education center supported by the Missional Wisdom Foundation. Falcon Ridge is a new development along the Boulder Creek Way off Cisco. 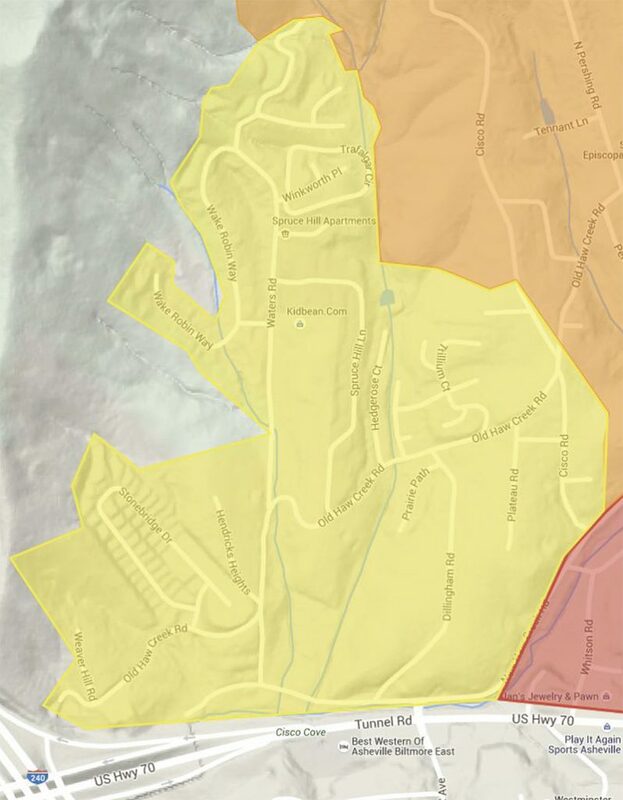 Southwest Haw Creek(YELLOW) is the section that includes the end of Old Haw Creek, Dillingham, Waters road and Spruce Hill Apartments, Hawthorne Villages, Mayfair Glen, Prairie Path, Wake Robin Way and part of Cisco rd. Newer communities of Stonebridge Drive and Weaver Hill Rd are on the west and Babak’s Welding and Art is on the east. Southeast Haw Creek(RED) is the part of Haw Creek that is the smallest, but has the most businesses, as it is bordered on the south by busy 70E (Tunnel Road East). There is: Prestige Motors, Highway Control, Hyundai, the East Asheville library, Wells Fargo, the Folk Art Center, Blue Ridge Pharmacy as well as Creekside Taphouse, Haw Creek Mews, Groce Methodist Church and the Haw Creek Park. New Haw Creek Road borders this Southeast section along the north. East Haw Creek(GREEN) could almost be divided in two again because it is so long. It extends from Maple Drive to Sleepy Hollow to East Bell road, Ozark Springs, Dogwood Grove and along New Haw Creek to Keenan Road. There is access to Maple Drive Park that leads through the forest to the Parkway and Mountain to Sea Trail. 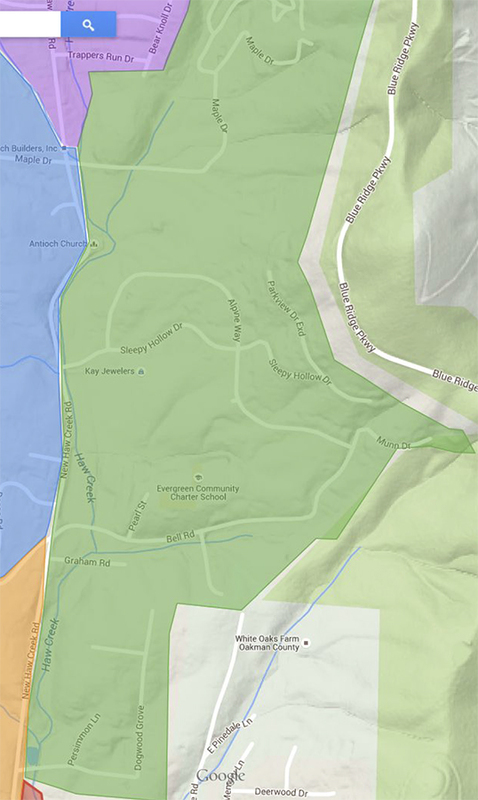 Evergreen Community Charter School and the East Asheville Recreation Center is located centrally in this section.